"You will know that I am the LORD"
Some of the following notes are adapted from the INTERNATIONAL INDUCTIVE STUDY BIBLE, New American Standard Version from Precept Ministries International. If you don't already own one, I highly recommend you consider purchasing one (Click here) if you are interested in inductive Bible study. 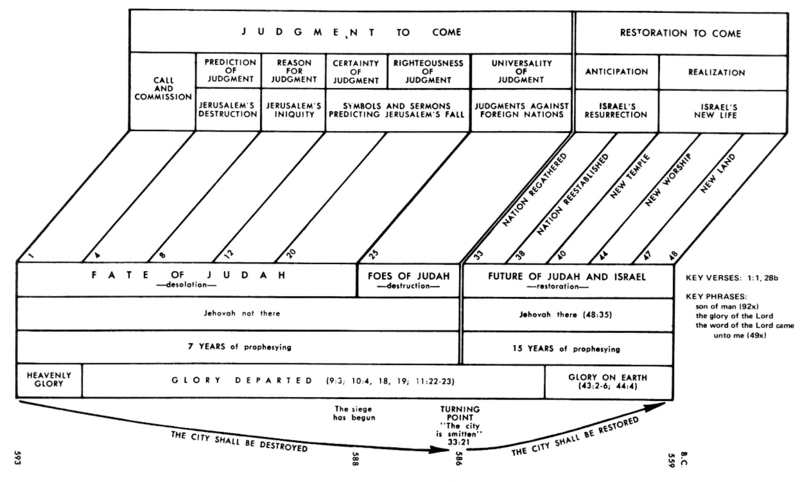 NOTE: Refer to the Timeline above to help get an overview of the timing of the prophesies of Ezekiel. Most of the following questions can be answered from a careful study of the Timeline. What are the events associated with the three key dates in red? What happened to the Northern 10 tribes? What are the 3 stages of the fall of Jerusalem and who went into exile with each stage? Where and when did Ezekiel begin his prophetic ministry? How long did he prophesy before the final fall of Jerusalem? When does the glory depart? Where is this tragic divine departure recorded? From those same passages, why does the glory depart? When was the departure of God's glory prophesied - before or after the fall of Jerusalem? When does the glory return (what is the the first fulfillment of the glory returning)? Where is the glory today (cf 1Co 3:16, 6:19 20, 2Co 3:18, Mt 5:16 1Cor 10:31)? 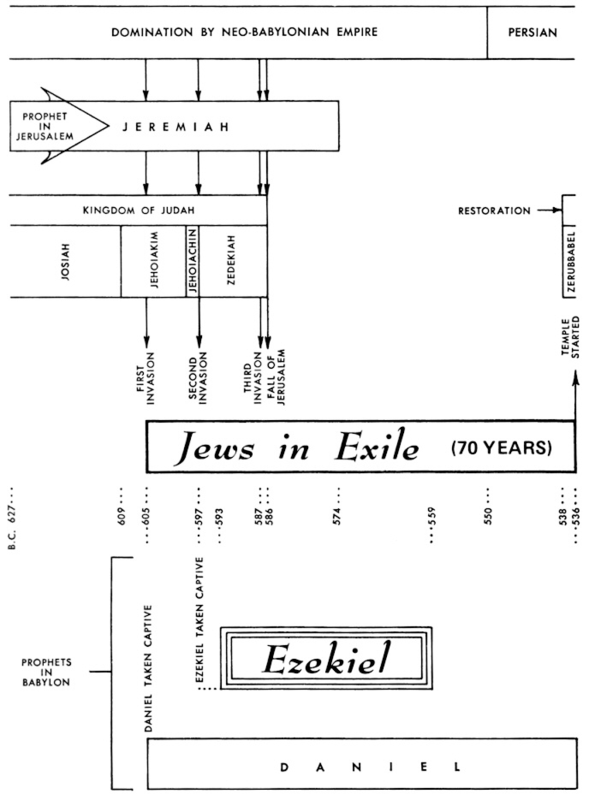 Note that there are 5 segment divisions of Ezekiel are at the top table of the chart at the top of this page. These segments provide a good way to divide the book up for profitable study and suggestions for inductive study are given for each segment division below. Don’t get overwhelmed by the dating of events. I suggest that you record the dates of events in the margin next to the corresponding Scripture. I also suggest recording key cross references in the margin which will prove helpful in the future when you refer to these sections (unless you buy a new Bible and then you have to begin all over again). 931 BC The United Kingdom composed of 12 tribes was split (see 1Ki 11:1, 4, 7, 11 and following chapters) into Israel (10 Northern tribes with capital in Samaria) and Judah (2 Southern tribes with capital in Jerusalem). 722 BC The Northern Kingdom was taken into captivity by the Assyrians. (see 2Ki 17:1ff especially 2Ki 17:5, 6). Although I alluded to the “10 Lost Tribes” as one of the astute Bereans reminded us they are not in fact lost and this idea can lead to some faulty theological conclusions. Bible Knowledge Commentary adds that “Paul’s reference to the 12 tribes of Israel shows the error of British-Israelism” (which simply stated holds that the Anglo-Saxon peoples, especially England and the US, are descended from the 10 Northern tribes and therefore inherit the promises addressed in Scripture specifically to Israel. This is not Scriptural and we will probably briefly touch on some of these points in class). (see Acts 26:7, Jas1:1, Re 21:12 as support that these 10 tribes are not “lost”). 609 BC In 2Ki 23:29 (CP 2Chr 35:20, 21, 22, 23, 24) God's judgment on Judah began when King Josiah was killed on the plain of Megiddo trying to stop Pharaoh Neco, king of Egypt, on his way to Carchemish on the Euphrates. Note that the events rapid cascade downward to doom for Judah in the following chapters as recorded in 2 Kings 24 & 2 Kings 25. 605 BC In Jer 46:2 Pharaoh Neco was defeated at Carchemish by Nebuchadnezzar, king of Babylon. 605 BC 1st SIEGE OF JERUSALEM & EXILE TO BABYLON: is described in 2Ki 24:1, 2, 3, 4, 5, 6, 7. (Record this date in your Bible margin) In 605 BC Ezekiel was 18 years old when 15 year‑old Daniel and his 3 friends were captured by Nebuchadnezzar and taken from to Babylon. Daniel’s prophetic ministry from Babylon began about 605BC. Ezekiel was left behind in Jerusalem. At age 30 he would be eligible for the priesthood but before he reached that age he was taken into exile in the next invasion described below. For the next several years things were relatively quiet in Jerusalem and Judah. The false prophets were bringing “good news” of peace (cf Jer 6:14) and the people loved it (cf Jer 5:31) and continued in their sin. Only one lonely voice disturbed their peace ‑ the voice of Jeremiah prophesying in Judah (cf Jer 1:9, 10). 597 BC 2ND SIEGE OF JERUSALEM & EXILE TO BABYLON: is described in 2Ki 24:10, 11, 12, 13, 14, 15, 16 (Record this date in your Bible margin) When Jehoiakim died, Jehoiachin succeeded him as king of Judah and in 597 B.C. Nebuchadnezzar, who with his defeat of Neco had become the dominant world power, besieged Jerusalem for the second time taking King Jehoiachin into exile to Babylon (this event in 597BC helps understand “the fifth year of Jehoiachin’s exile” specifically given by in Ezekiel 1:2) along with 10,000 Jews, one of whom was the young man Ezekiel. 1. Read Ezekiel 1:1-3:27 and mark distinctively (with a color &/or symbol) the key words or phrases. Below are some of the key words and phrases you will be looking for. When you find one don’t just mechanically mark it, but interrogate the word or phrase with a few questions (Who? What? Where? When? Why? How?- See interrogate with the 5W'S & H). “What” do you learn for example about the “glory of the Lord” when you find that passage?, etc. Ezekiel 1:1 says “the 30th year” and it appears in context to refer to Ezekiel’s age of 30 years, the year in fact that Ezekiel would have been eligible for priesthood (see Nu 4:3), he begins his prophetic ministry. What year was this? Verse 2 explains that it was “the fifth of the month in the fifth year of King Jehoiachin's exile” which would be 593 BC because Jehoiachin was taken from Jerusalem to Babylon in 597BC, and so the fifth year would be 593 BC and this was the year Ezekiel began his prophetic ministry which would span 2 decades ending around 573 BC. Remember Ezekiel is prophesying from exile to Jews in exile before the final destruction of Jerusalem in the first 24 chapters that emphasize judgment. Once the siege begins, he switches to prophecies against the Gentile nations some of whom are scoffing at Jerusalem. Then after the fall in Chapter 33, he shifts to a message of hope which includes the promise of a new heart. Read 2Ki 24:1ff-2Ki 24:1-21 for a good overview of the historical setting and if you haven’t done so yet, record the dates of the 3 STAGES OF CAPTIVITY alluded to in these passages . This will help you understand the timing of Ezekiel's prophecies. Ezekiel has many references to time and you will want to mark these in a distinctive way (e.g., a “clock face” in the margin). There are 13 dated references in Ezekiel and they are listed below. I would suggest recording these in the margin next to the respective Scripture. 2. As you go through these chapters one at a time, interrogate the text with the five W's and an H. Ask questions such as: What does Ezekiel see? How are they described? Where are they? Where is Ezekiel? What is he told to do? Why is he told to do it? When is Ezekiel to speak? Note what Ezekiel is called to do and how he is to do it. Also note to whom he is sent and why. Record your observations on a separate piece of paper. 4. In summary form list everything you observe from the text about Ezekiel, the people to whom he was sent, and the glory of the Lord. 5. Record the theme or title of each chapter remembering to try to use words that are actually in the chapter. If you have room in your Bible at the beginning of the chapter, record your title once you are satisfied that the title really summarizes what’s in the chapter. In other words don’t just title chapter 1 “God’s Glory”. Although that may be a valid observation, it would hardly distinguish this chapter from others. 1. Read through this segment one chapter at a time. Mark every reference to the time of a vision and key words or phrases. Be especially alert to mark the phrase “know that I am the LORD”. Note in the margin who is going to know and how they will know. When you mark Spirit, heart, and the glory of God, list on paper and then when you are satisfied with the list on your Bible margin what you learn about each of these key words/phrases in that chapter. In this section add covenant to your list of key words and list what you learn. 2. Now read through each chapter again. Watch for every reference to the son of man. In the margin note God's instructions to Ezekiel, the son of man. Note to whom or to what he was to speak and how. Note whether it was by symbolic acts, messages, visions, parables, or signs. Note why he was to speak in that way and the significance of his action. Notice when Ezekiel's mouth is shut and then later opened. 3. Record the chapter themes/titles as discussed above. 4. Note that Ezekiel 8-11 is a unit composed of several visions. Where is Ezekiel? How did he get there? What happens to the glory of the LORD? Note the progression in your margin. 1. Read through this segment one chapter at a time marking the key words. When you mark the phrase know that I am the Lord, note in the margin who is going to know and how they will know it. How do your observations in this section compare to God's covenant promise to Abraham that "I will bless those who bless you, and the one who curses you I will curse. And in you all the families of the earth shall be blessed." (Gen 12:3)? 2. On the second reading of the chapter, identify and record in the margin the nation to whom the prophecy is given and the ruler if mentioned. Note what will happen to the nation and why. 3. Make sure you note or mark when the word of the Lord came to Ezekiel. 4. Record the theme/title of each chapter. 5. The distinctive thing about Ezekiel’s foreign oracles, apart from their focus on Tyre and Egypt, is that they are more related to contemporary history than are those of Isaiah, Jeremiah, or Amos. Seven of the thirteen dates in Ezekiel are in this section ( Ezek 26:1—587 ; Ezek 29:1—587 ; Ezek 29:17—571 ; Ezek 30:20—587 ; Ezek 31:1—587 ; Ezek 32:1—585 ; Ezek 32:17—586 ). Four of these dates refer to a day and month in 587 b.c., very close to the time of Jerusalem’s destruction. a. Mark every reference to time. Do not miss when the visions or prophecies were given to Ezekiel. b. Mark every key word. In the margin list what you learn from marking covenant and then compare it with what you observed about covenant in Ezekiel 16-17.
c. Continue noting the same observations from marking every occurrence of know that I am the Lord. Also list what you learn about the Spirit, heart, and the glory of God. 2. Read the chapter again. List God's instructions to Ezekiel ("the son of man"). Note to whom or to what he was to speak and what the message was to be. As you look at the proph­ecy, list what is going to happen, to whom or what it will happen, and when it will happen­. Put a symbol next to any indication of timing. Also note any symbolic acts he was to perform and why. 3. List the theme of each chapter as before. 1. As you begin observing this final segment, read Ezek 40:1, 2, 3, 4, 5. In a distinctive way, mark when the final vision is given. Then in the margin list who gives it, how, where, and what Ezekiel is to do. Remember to read for the literal sense of the passage, even if you do not completely understand the text. Resist the urge to glance at what the commentaries say until you have carefully observed the text. a. Mark key words as before; however, add to your list temple (sanctuary, house), holy, offering, and gate(s). The phrase "know that I am the Lord" is not used in this final segment. b. Watch for and record the reason for the vision of the temple and its measurements. Also note what you learn about the glory of the Lord and the Spirit, and their relationship the temple or sanctuary. Compare this with what you saw in Ezekiel 8 through 11.
c. Warning: This last segment of Ezekiel may seem a little boring after the first 39 chapters. Don't get bogged down in all the temple measurements. Be sure to read the last verse of the book. 3. Record the theme of each chapter.